For the longest time, we’ve been witness to the crew at Acrylic Tank Manufacturing (ATM) adding significant amounts of fish to brand new aquarium systems that they installed for their television show “Tanked”. The aquarium hobby as a whole expressed very negative opinions of the show and the husbandry techniques shown, which drew some comments from Brett Raymer of ATM. Hobbyists were promised that the aquariums were fit for aquatic life due to the addition of bacteria and other products that neutralize ammonia and nitrite. Additionally, the aquarium community was told about a new line of aquarium additives being developed by ATM. After a few months of waiting for these miracle additives that almost instantly cycle an aquarium to become available, they have finally surfaced. At the moment, ATM is offering up six different products aimed at neutralizing chlorine and chloramine, speeding up the nitrogen cycle, binding phosphates, and even cleaning the glass. 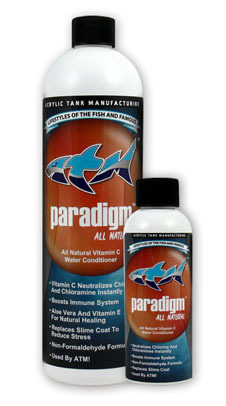 The first product in the ATM additive lineup is an all natural water conditioner called Paradigm. The product contains ascorbic acid that “instantly” removes chlorine and chloramine from tap water, vitamin C to boost fish immune systems, and aloe vera to promote natural healing. A second water conditioner called Barrier is also available. It performs basically the same “instant” neutralization of chlorine and chloramine as Paradigm, but contains sodium thiosulfate instead. 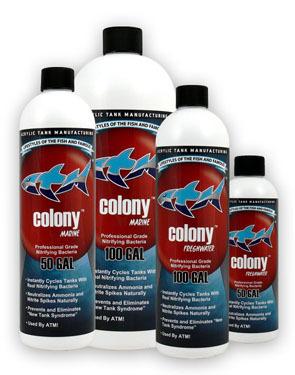 Next up on the additives list is a bacteria-based product called Colony. According to the product description, Colony contains nitrifying bacteria that “instantly” (there’s that word again) creates a biofilter to handle ammonia and nitrite breakdown. 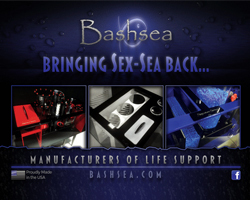 Two different versions will be available, one aimed at freshwater aquariums and the other at saltwater setups. The aquarium cycle is said to be reduced to just days instead of weeks, but ATM still claims that these products are “the champions of instant cycling”. Outbreak, the next product to be on the chopping block, is a biological sludge remover that decomposes organic waste. It is supposed to keep aquariums clean and aid in biological filtration, while at the same time eliminating smells associated with dirty tanks. Like Colony, Outbreak is a bacteria solution. The last product from ATM that we’ll talk about is the phosphate removing additive Agent Green. This product uses lanthanum chloride to bind phosphate with calcium. This process makes the phosphate insoluble, allowing it to be removed from the aquarium through various equipment like the protein skimmer. Now that all of those details are out of the way, let’s get to the opinion. For starters, the prevalence of the term “instant” really irks me. We abhor those miracle chemicals that promise to do things instantly, so seeing this term all over the ATM additives doesn’t sit well. The aquarium cycle, which admittedly isn’t the best part of the aquarium setup process, is a necessary evil that can’t be done instantly or even overnight. Sure, products can speed this process up significantly, but the time frame often cited by these products and more is simply unattainable. Proven probiotic systems such as ZEOvit and Prodibio don’t even make such lofty claims, as they promise to only cut the cycle time in half and not down to zero. The next issue we have is with a statement surrounding the use of RO/DI systems to start a new aquarium. The literature provided by ATM on the nitrogen cycle is so bold to say that tap water should be used in place of water from a reverse osmosis water filtration system. Their claim is that RO water is devoid of phosphate, and therefore is not a good candidate to start an aquarium because nitrifying bacteria will be deprived of phosphate and not be able to thrive. While we do understand that phosphate does fuel bacteria and other things, to claim that an RO filter is bad for an aquarium is ludicrous. Tap water is a terrible source of aquarium water. It contains so many pollutants that either harm or kill aquarium livestock. Sure, you could buy some of ATM’s wonder additive to bind these chemicals, but why not remove them before they ever enter your aquarium? Instead of relying on a chemical that will only get some of the pollutants, get a filter to remove them almost entirely before they get a chance to stress any of your livestock. Also, please keep in mind that a new aquarium with a fresh pile of live rock will have plenty of phosphate, ammonia, and nitrite to feed your bacteria and get a healthy cycle going. Not to mention, most of the aquarium salts and substrates will have phosphate in them to some extent already. Point behind this rant, use a reverse osmosis filter to start your aquarium and to perform any and all future water changes. In closing, it should be noted that these products being touted by ATM are not anything they actually came up with on their own. Each of these products is simply a re-branded item from a company called SuperBac. If the product descriptions weren’t a dead giveaway, the simple fact that the Chief Marketing Coordinator (name intentionally left out) for ATM is the same person who handles the SuperBac products. We wanted to also thank Keith from Super Pet World for sending us the information on these products. LOL thats all I got to say. And Superbac is just a rebrand of another line. What a joke! Nice write up. The real question is, is there any evidence that these products actually do what they say they do? The author used the word “rant” and that is exactly what this article is. As a newcomer to the marine aquarium hobby 30 years ago, briefly, then 8 months ago), I am continually surprised at the close-minded attitudes of some of our fellow hobbyists. The author provides no usable information re: these products. He just makes it clear he doesn’t like ATM’s claims. I first learned of ATM while watching the show “Tanked” and, like others, was shocked when, on numerous occasions, ATM employees dumped thousands of dollars of fish into tanks that had just been filled with “regular” water. While it may shock us and our persnickety, hobbyist ways, I’m sure ATM isn’t in the habit of selling a customer a very expensive tank installation only to have their brand new fish die (in front of their customers) from improper acclimation. In other words, they must know what they’re doing and to suggest otherwise sounds a little snooty. I’d be more interested in a comprehensive test to determine if these products actually perform as promised. Also, who cares who originally invented the formulas for the products? As long as the formulas have been obtained legally, if ATM can popularize a product that makes marine aquarium maintenance easier and therefore, more popular, it’s better for everyone. unfortunately, some customers don’t know or care enough about their aquariums to know when things are going wrong and when fish are dying. they just keep pumping money into the aquarium as an attraction piece/amenity to their business. there have been rumors circulating around the net where some tanks featured on the “tanked” tv show were shut down because all of the fish died. the owners couldn’t afford to keep buying replacement fish. one of these aquariums was listed on ebay (the telephone aquarium) only a few weeks after the episode aired. the diner jukebox aquarium was another tanked said to have all of the livestock in it die. some customers can keep up with the fish replacement bills, others cannot. yes, we have a beef with the tv show. we don’t like what it portrays and we don’t like that people setup aquariums based on what they see on tv. from a hobbyist standpoint, they are showing every wrong way to do things. hobbyists should take their time, let the aquarium cycle, and slowly add fish. not set up an aquarium overnight and dump a few dozen fish into it. I can’t believe the comments below are serious. Do you guys really believe that what you see on a TV reality show is real-time? Obviously its condensed for the viewing time but in real “reality” it took hours or sometimes days. The simplest example is when you see them put the sand in, and then fill the tank with water. Anyone with even the smallest amount of experience with an aquarium (like my little daughter the other day when we were watching an episode of Tanked) will tell you that it takes hours and sometimes days for the sand to settle, and on TV 5 seconds later the aquarium is full, water is crystal clear, and the fish are put in. No, what you see is 100% NOT what they are actually doing, but if you have a personal beef with the show then go ahead and rant. And now nearly 3months latier my tank is thriving. Atm cokony started my tank cycle “instantly” and my corals are now spawning my fish are happy and I’ve had no problems. Hello Tanked employee… seriously, with all the better brands of water conditioner and colonizing bacteria like biospira, prime, and Dr Tim’s why even come out with another redundant product line that is made from the same stuff and is generally more expensive? I guess these guys wouldn’t be original or creative because they really have no idea what they are doing. Any one of the plethora of products and have given you the same results. Atm hasn’t come up with some miracle. Open a bottle of prime and a bottle of atm barrier and it is the exact same stuff.